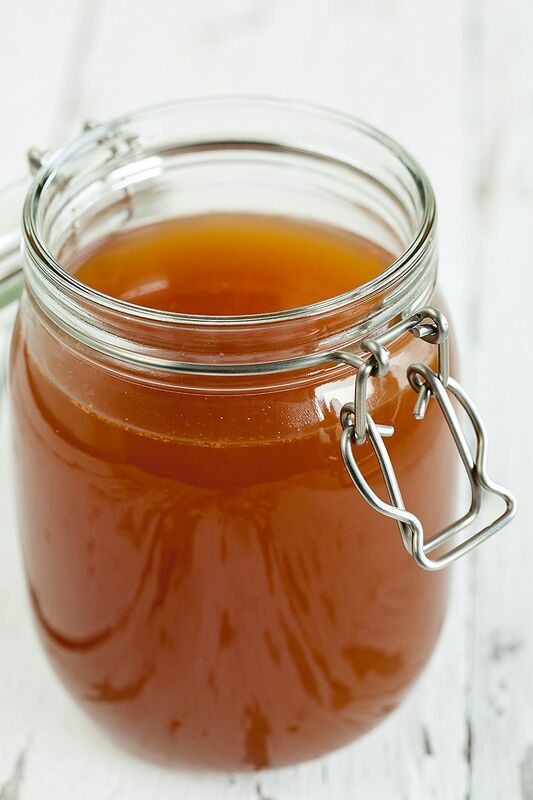 Making your own stock is easy, delicious and it’s a good way to empty your fridge. Basically, you can make any kind of stock you want. 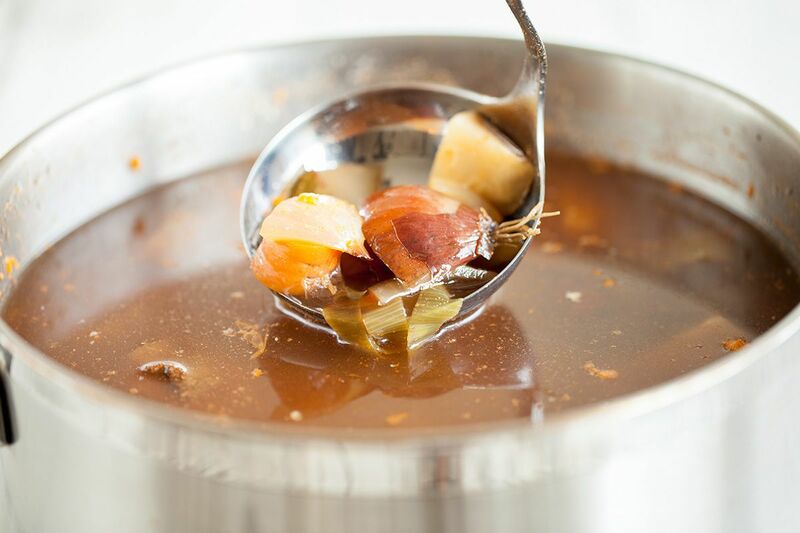 But now, we’re going to show you how to make a beef stock full of flavors. Exactly like you’d get in restaurants, which you love, right? PRE-HEAT the oven to 225 degrees celsius or 435 degrees fahrenheit. 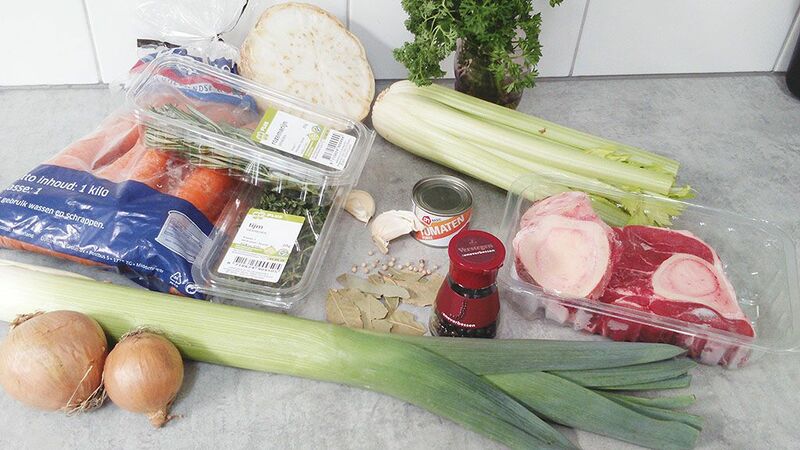 Start cutting the leek, onions, garlic cloves, carrots, celery stalks, celeriac and also the beef meat into large chunks,. No need to peel any of them, you’re gonna throw them out afterwards anyway. Most easy and fastest way is to wash the veggies all at once in a colander. Drain the veggies and get a large baking tray. Divide the marrowbones, beef bones, veggies and tomato paste on the plate. Place them in the oven for about 30 minutes, until they are all nicely brown. The smell will be amazing and roasting everything will give the beef stock such a beautiful color and rich taste. ADD the roasted meat, bones and veggies to a large pan. Pour in about 2,5 liter of water, sprigs of rosemary, thyme and parsley. Also add the bay leaves, junipers and peppercorns. Now let it simmer on low heat for at least 1,5 hours (with the lid on). The longer it will be on the stove, the stronger the taste will be. When halfway cooked, carefully remove some of the fat that rose to the surface. If you have a cheesecloth, use it to drain the beef stock. When you don’t have a cheesecloth, you can use a fine sieve to drain. 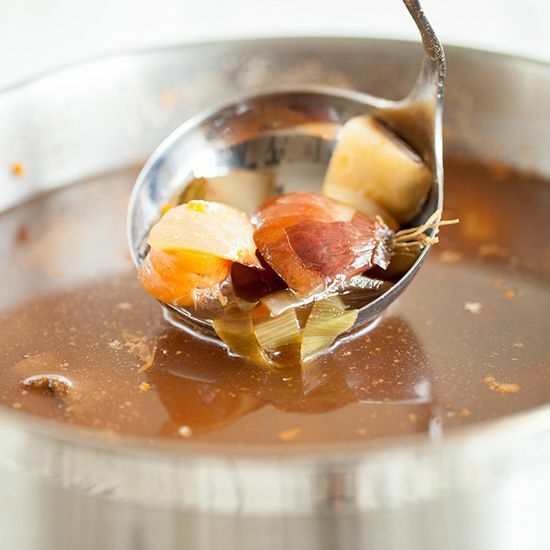 Throw everything out, and if you have some nice meat left, use it as little pieces of meat to serve with this beef stock. Now it’s ready to use as a great base for about everything you like! Soups, stews, sauces, you name it.